The Grasslands is always the first place for newbie adventurers. It is peaceful flat land with fresh rivers, ponds and green grass all around. These grasslands have stayed the same for many generations although not much of it is left now due to the building of the large town next to it. This has lead to the wildlife being cramped into this one spot. Not much else to tell. It's natural flat grassland. This is the first area in the world of my work in progress game MEGA Craft (in game world name not confirmed yet). It is a world dominated by 3 intelligent creatures. The ponies, the wolfs and the dolphins (actual names pending). The ponies are warriors and very brash and aggressive, the wolfs are hunters which prefer using archery and traps and the dolphins are uppity mages. The world is covered with magical creatures and is dominated by the concept of crafting and collecting. One's value is associated with what they can craft and the places they have been to achieve those fetes or at least that is what you think. You are one of the 3 dominant species who is fed up of its normal farming life and goes on a quest to become the best crafter there has ever been. The Beginner Grasslands is a flat land covered in grass and small flowers with a river flowing in the middle. There is a wooden bridge over the river and there is Sunny Hills going to the shore and cliffs to the left. 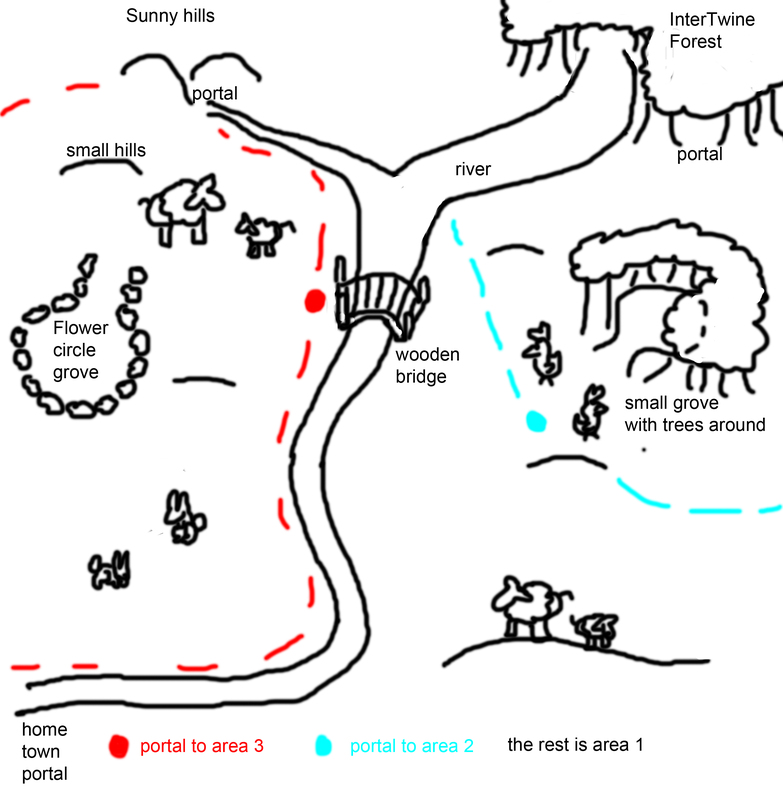 There is the InterTwine Forest and more locations continuing from there to the right of the river. There also little groves where creatures like to settle but they also like to wander around the plains freely. The path you enter to this area with is parallel to the river and comes from the town you have called home for most of your life. This is a doodle concept art for the layout of the location Beginner Grasslands in my work in progress game MEGA Craft. This is the first wild area you go to after the town you start in and it is a beautiful flat land of grass with a river flowing down the middle. The area is bursting with life which is easy to hunt. Every wild location in the game is split into 3 areas which will be separate screens but all part of the same location. There is a coloured key for you to see the general space and subjects which will be in each area. The proportions and exact location of some of these subjects in the location are not 100% accurate and may differ to the final project.